The KA Electronics EEQ-12 Elliptic Equalizer for vinyl mastering is a unique 12 dB per octave design based on work published in the Pro Audio Design Forum. This listing is for the bare PC board and ICs including 2 THAT1246, 4 THAT1240, 4 NJM2114D and 2 THAT1646. What is an Elliptic Equalizer? An "elliptic equalizer" is used during vinyl mastering to prevent playback skipping on music having wide stereo bass. The bass-to-mono elliptic EQ gets its name from the width of ellipses in the recorded groove or Lissajous patterns on an oscilloscope. If the width of the recorded groove becomes too narrow from stereo bass, which produces large "vertical modulation" of the cutter head, the playback stylus can be pinched out of the groove. Elliptic EQ high-pass filters the difference, or "Side" information, to convert low frequency vertical modulation of the cutter head to lateral. Elliptic equalizers (EEQ) historically had 6 dB per octave filter slopes. When Side is high-pass filtered to provide EEQ, a low-pass response, also at 6 dB per octave, is created in the stereo crosstalk curve. When elliptic equalization is used to make low frequencies mono, midrange separation and stereo imaging are impaired at a 6 dB per octave rate. Due to their sonic footprint, EEQs are only used when necessary. The EEQ-12's improved separation changes that. Steeper high-pass filters don't improve crosstalk. A Side high-pass filter with a slope greater than 6 dB per octave steepens the EEQ response, but the crosstalk curve, which is subtracted or "derived," will have a 6 dB per octave slope regardless of the high-pass filter's steepness. The Left and Right outputs also produce undesirable response peaking. The steeper the high-pass filter the greater the peaking. The limitation of asymmetric slopes and response peaking in an EEQ with slopes greater than 6 dB per octave is similar to derived loudspeaker crossovers. The work of crossover designers Linkwitz, Self and others in solving these limitations in speaker systems have been applied to the EEQ-12. Elliptic Equalization based on crossover design. The KA Electronics EEQ-12 has 12 dB per octave slopes in both its vertical and crosstalk curves. By borrowing techniques from crossover design, a phase-correcting network in the EEQ-12's Mid signal path compensates for the phase response of the Side filter. 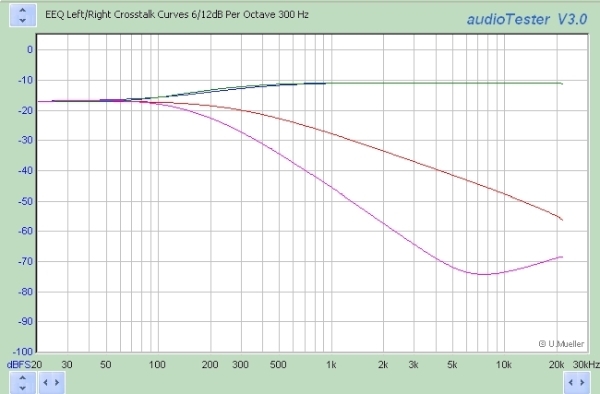 The result is a symmetrical, 12 dB per octave response in both the vertical high-pass and low-pass crosstalk curves. 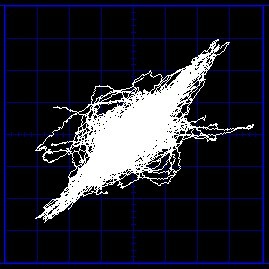 Midrange imaging is maintained with a low sonic footprint. The EEQ-12's steeper high-pass response allows the EEQ frequency to often be set an octave lower and, when combined with a crosstalk curve an octave lower and falling twice as fast, midrange separation and imaging are doubly improved. 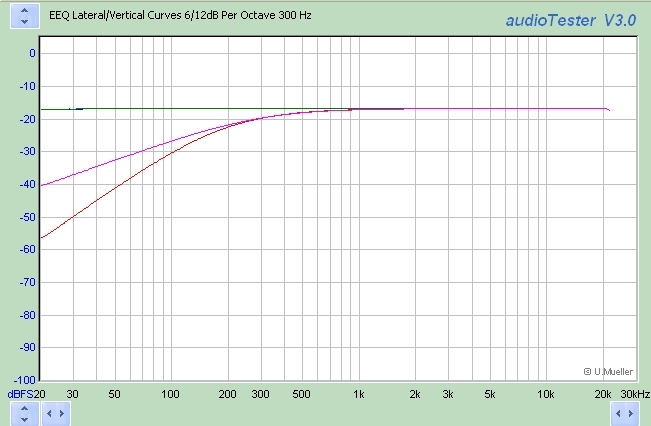 The following curves show the EEQ-12 switched between 6 and 12 dB per octave at 300 Hz. At 1 kHz the EEQ-12 has about 35 dB separation versus only 20 dB for a conventional 6 dB per octave EEQ. A phono cartridge may have up to 30-35 dB of midband separation. The improvement in stereo imaging on playback is significant. The following sound file compares the EEQ-12's crosstalk at 12 dB per octave (0-0:12 seconds), 6 dB per octave (0:13-0:28) and 12 dB per octave (0:29-0:37). The EEQ-12 frequency is 150 Hz. One channel is driven. The opposite channel's output, containing desirable bass cross-feed and undesirable crosstalk, was recorded as a mono file. The midrange leakage heard in the 6 dB per octave example is the reduction in separation that occurs with conventional EEQ. Other applications for the EEQ-12 Elliptic Equalizer. 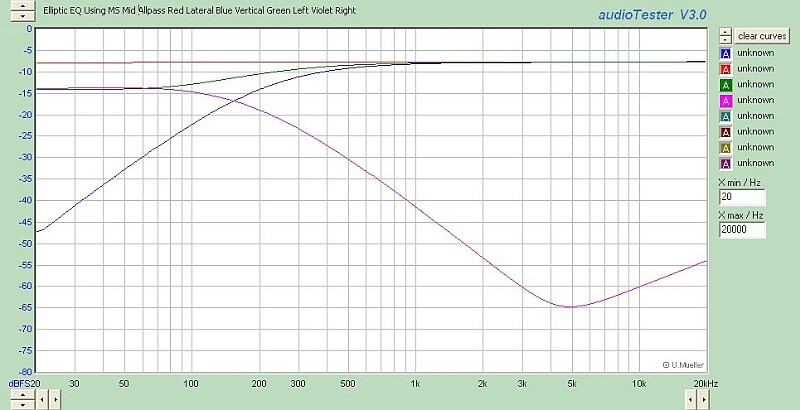 Elliptic equalization is ideal for warp reduction during vinyl playback or transfer. Warp is primarily vertical. Due to playback and cutting limitations described earlier, vinyl recordings do not typically contain recorded vertical content at low frequencies. The EEQ-12 filters low frequency vertical warp without filtering the lateral mono bass. When compared to conventional Left/Right infrasonic high-pass filtering, the EEQ's cutoff frequency works octaves higher without audibility. The "bass-to-mono" cross-feed of the EEQ-12 creates an "in head" low frequency focus for headphone listening. 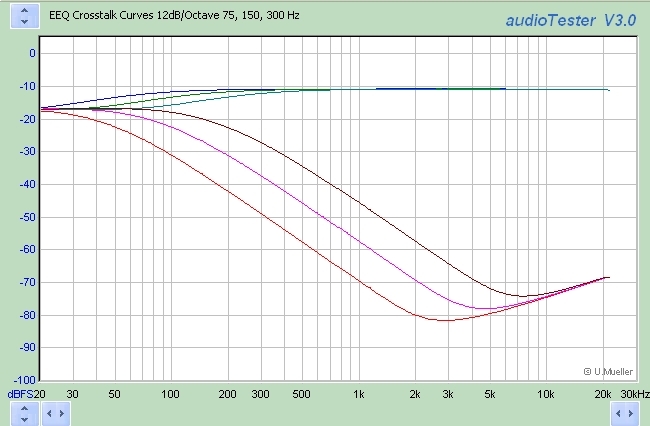 No amount of EQ can correct a wide, flabby-sounding, bottom end. Slightly "woolly" or "tubby" bass in recordings with too wide a low end for 'phones tighten up to develop "point" and impact. You don't want stereo bass that's panned to the opposite end of the room. Bass-to-mono processing during mastering with the EEQ-12 limits ultra-wide hyped stereo bass detrimental to dance, club and other large venues. 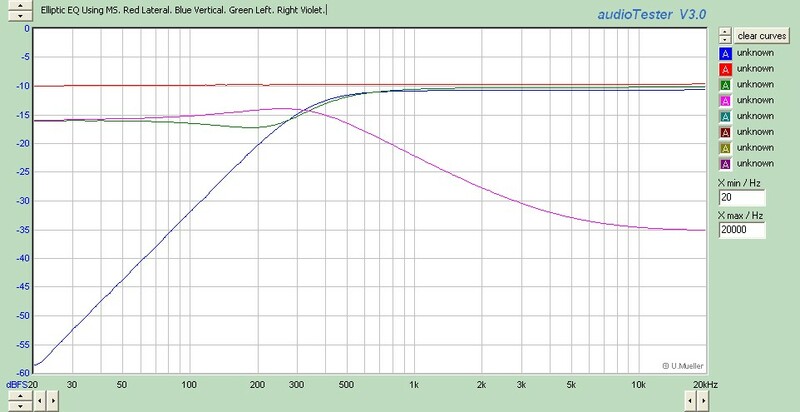 Bass-to-mono also assists small speakers by distributing low frequency content more evenly between drivers. The EEQ-12's low sonic footprint and increased separation are particularly important for formats not destined for vinyl release. The EEQ-32 Elliptic Equalizer internal Mid/Side "MS" filters and can be used with conventional Left and Right inputs or MS encoded material. For Left/Right sources, the EEQ-12 provides on-board Mid Side encoding. Fully-balanced THAT1246 ICs receive the Left and Right inputs. MS duties are performed by THAT1240 precision sum and difference amplifiers. The EEQ-12 can accept external unbalanced MS inputs to add EEQ functionality to the Precision MS Matrix. When the EEQ-12 is inserted at point "F" the MS matrix's balanced inserts remain available for upstream Mid/Side processing. External MS requires only four ICs to be installed in the EEQ-12. The EEQ-12's internal MS signals are decoded on-board to provide balanced Left/Right outputs, using THAT1646 OutSmarts® line drivers, or jumper-configured to provide direct unbalanced MS outputs for external decoding. The EEQ-12 can be configured for either relay or switch-based tuning. On-board relays select Off, 75, 150 and 300 Hz with a single-pole rotary switch or contact closure. (Other frequencies are available by changing resistors.) A four pole multi-position rotary switch with external resistors may also be used to directly tune the EEQ-12. Relays provide a very cost-effective solution for modulation plus preview applications which require a costly eight pole switch. The EEQ-12 can also be relay-switched from symmetrical 12/12 to 6/6 dB response to emulate conventional 6 dB per octave EEQ identical to the Neumann EE-70 or EE-77. An optional 12/6 "uncorrected" mode is also available for experimentation. The EEQ-12 provides hard-wire relay bypass for external MS-encoded sources. When the internal MS matrix is used, relays provide comparative "soft" bypass. Full hard-wire bypass using Left/Right connections require an insert switcher. 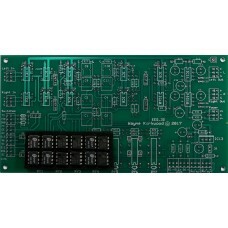 Current-limited LED tally outputs are provided for switch illumination of bypass and filter slope. The relay and LED supply is electrically-isolated from audio ground. An optional on-board relay voltage regulator permits the EEQ to be used with an unregulated or higher-voltage supply. 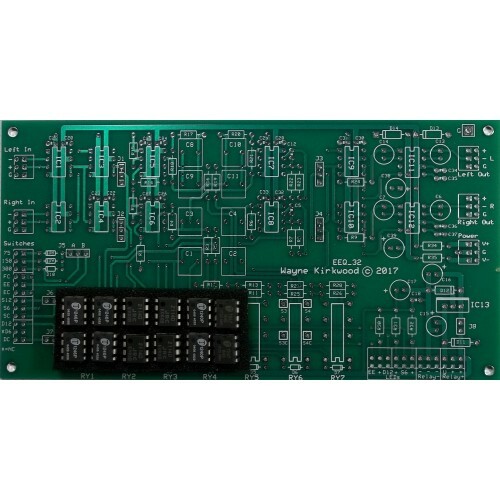 The EEQ-12 Elliptic Equalizer is sold as a bare PC board, a "kit" including semiconductors, or an assembled and fully-tested module. A Mouser Electronics Project Manager bill-of-materials is available for DIY builds of the EEQ-12 Elliptic EQ.